The Hagerstown & Frederick Railway Historical Society is dedicated to promoting and preserving the heritage of the trolley line that served Washington and Frederick Counties in Maryland. We offer historical and technical data, as well as educational information to members and the public. Founded in 1999 by three model railroaders, the HFRHS was created to preserve a vital part of Western Maryland heritage and culture. The trolley line provided a vital link for the area’s farmers, merchants, and students for almost 60 years during the 19th & 20th Centuries. As our region has grown, much of the history has been lost to apathy and development. Less than a dozen original structures and 4 cars remain in restorable condition. Our members are the backbone of our efforts. 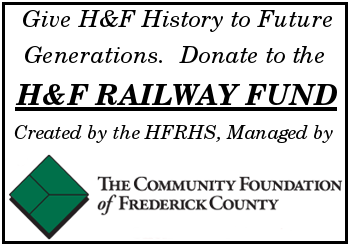 Your membership keeps the HFRHS alive, and shows the community that you care about the preservation of Hagerstown & Frederick Railway history! Being a completely volunteer organization, all dues go toward the operation and continuing efforts of the Society. Access to our “Trolleywire” Newsletter. Access to the Society archives. Access to our online archives database (coming soon). Updates about H&F related activities. Invitations to assist in society programs, outreach activities, and preservation efforts. A vote at Society business meetings, giving you a say in how the Society operates. 50% of dues are tax-deductible. Membership is good Jan 1. to Dec. 31. After Sept. 1, dues for remainder of the year are half off.